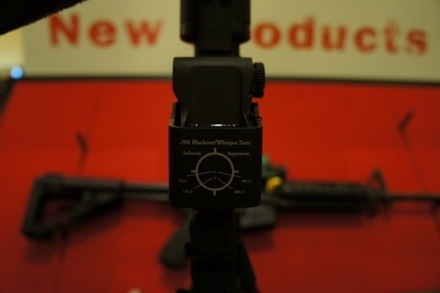 This photo shows the zeroing diagram found on the roof of EOTech’s .300 BLK / Whisper sight. 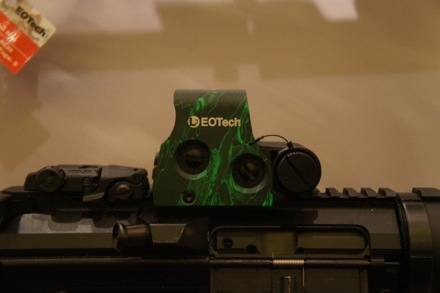 EOTech’s newest showings in their line of sights at this year’s SHOT can be seen above. 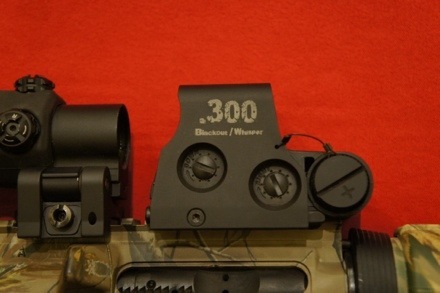 The first is a sight calibrated specifically for use with .300 BLK and .300 whisper. It features a two dot reticle that is set for two different ranges depending on whether subsonic or supersonic ammunition is used. Not shown is the diagram on the roof of the sight detailing this information. The other sight is the Zombie II. Practically identical to the original EOTech zombie sight, it features the same biohazard reticle, with the largest change being the inclusion of ‘Reaper Z’ camouflage. Other features include 20 brightness settings, a 600 hour run time on a single 123 battery, and attachment to a 1″ weaver rail or 1913 picatinny rail.